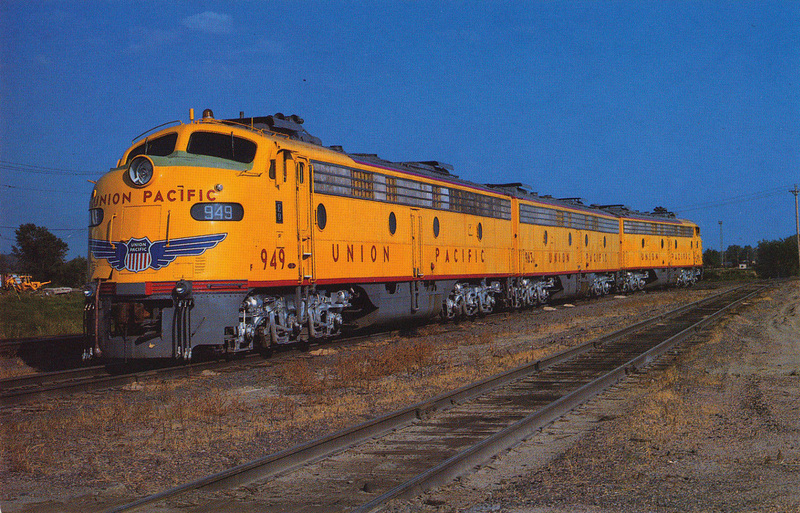 The Utahn was one of a few Union Pacific passenger trains during the streamliner era to last only a few years on the timetable. 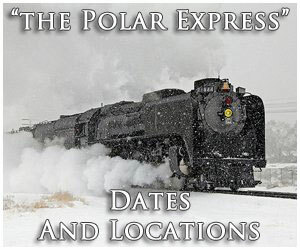 It was established soon after World War II as a means of operating in conjunction with the City of St. Louis to provide through service from St. Louis to Los Angeles with connections made at Cheyenne, Wyoming. Normally equipped with numerous head-end cars the Utahn was never a streamliner although in later years it did carry a few, handed-down lightweight cars. The train was intermittently powered by steam and an interesting mix of diesels from Alco, Fairbanks Morse, and Electro-Motive. 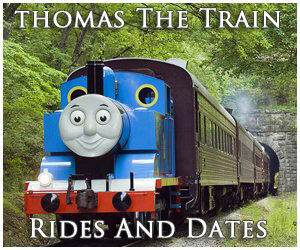 As UP continued to shuffle and change its passenger during the 1950s the train was discontinued early on during that decade. 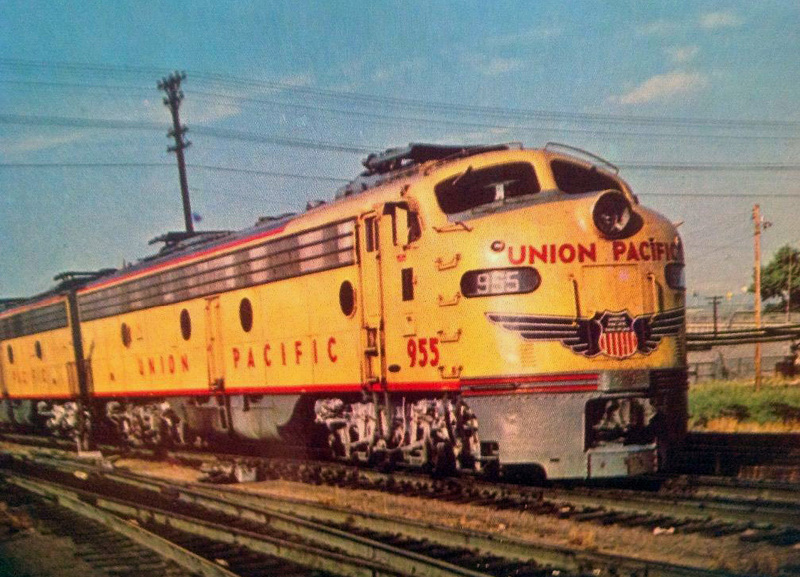 Following World War II Union Pacific redoubled its efforts to stay at the forefront of the streamliner movement and on par with anything competitors such as Santa Fe, Southern Pacific, Great Northern, and Northern Pacific were offering. By 1941 the railroad was already boasting ten streamlined City trains, one of the largest in the nation that had enabled UP to fend off the downturn in patronage brought on largely by the Great Depression and which had persisted throughout much of the 1930s. During 1947 it had acquired enough new lightweight equipment to offer daily service on many of its City trains, a move that required cancelling the San Francisco Challenger and Los Angeles Challenger to do so. Between 1949 and 1950 UP purchased even more new streamlined cars from Budd, Pullman-Standard, and American Car & Foundry to continue upgrading its transcontinental trains. Since the railroad worked with others including the Wabash, Chicago & North Western, and Southern Pacific to provide through service to Chicago, St. Louis, and San Francisco/Oakland all four participated in the equipment purchases. 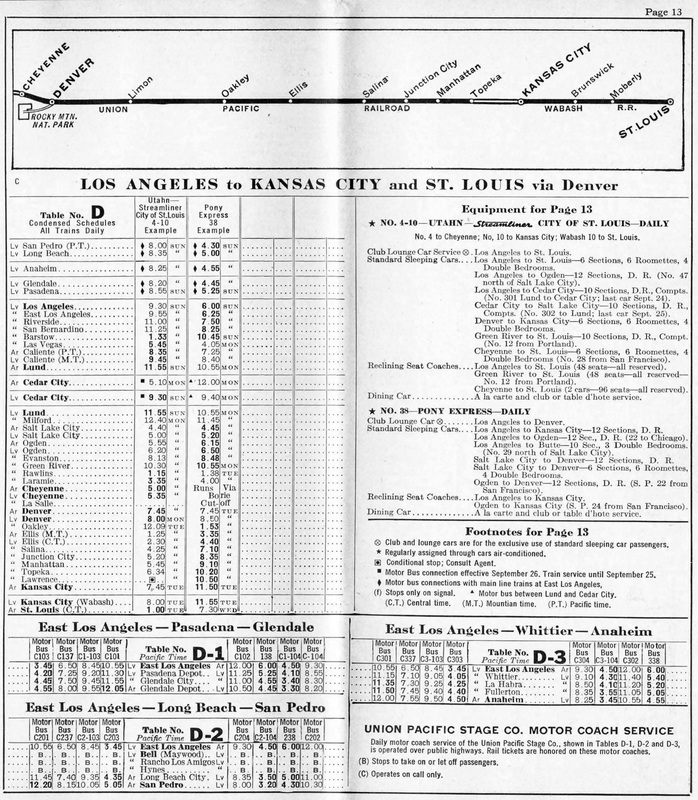 Aside from these improvements UP also began offering faster postwar schedules, introducing the regional City of St. Louis on June 2, 1946 operating between Kansas City and Cheyenne (UP took over the train from the Wabash at Topeka, Kansas, its eastern terminus). A year later it inaugurated the Utahn on May 14, 1947. 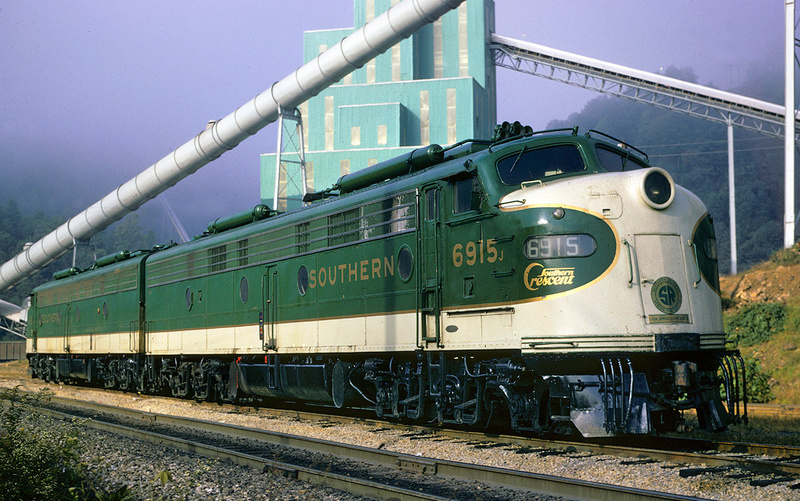 This new train connected with the St. Louis at Cheyenne and the two worked together in providing transcontinental service to Los Angeles. Listed as train #3 (westbound) and #4 (eastbound) the consist for the Utahn carried several head-end cars and through sleepers running to other cities. 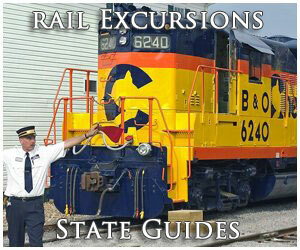 For instance, according to UtahRails.net in 1950 its assigned equipment would normally feature five mail cars, seven mail/baggage express cars, and three Railway Post Offices (RPOs). Additionally, there were five reclining-seat coaches, two diners, two dormitory-clubs, four standard Pullman sleepers (St. Louis-Los Angeles, Omaha-Los Angeles, Omaha-Denver, and St. Louis-Oakland), and a finally a coach sleeper (Omaha-South Torrington, tri-weekly). In all the Utahn was assigned about 29 cars although no individual train actually ran with this many with a normal consist usually including about four head-end cars, two coaches, a diner, club-dormitory lounge, a 6-6-4 lightweight sleeper, and a 12 section/1-drawing room heavyweight sleeper. From an operational standpoint the Utahn was powered by either the fast and powerful Class FEF 4-8-4s or an eclectic and interesting mix of diesels. Most who are at least a little familiar with Union Pacific's passenger operations are aware of its large fleet of Electro-Motive E7s, E8s, and E9s (it also owned early E2s, E3s, and E6s) which powered most of its trains. 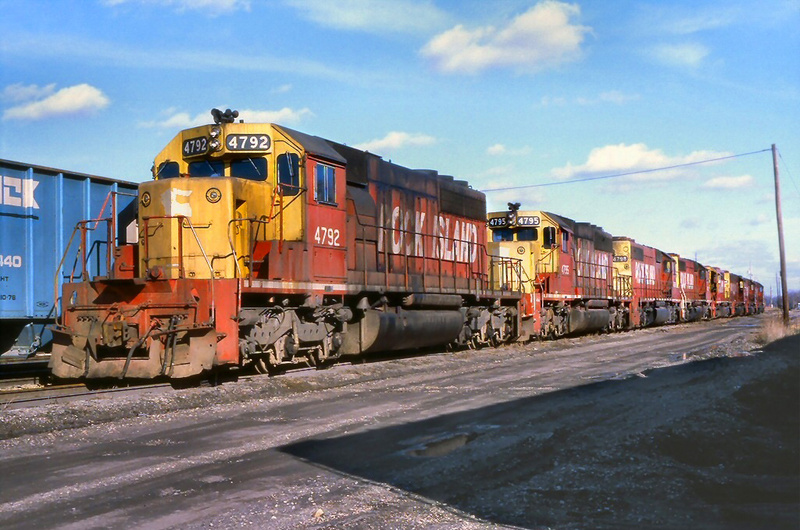 However, the railroad also rostered Alco's beautiful PA-1 and Fairbanks Morse's rare Erie Builts (they carried a look somehwat similar to the PAs). Both models were purchased directly after World War II and each could be found leading the Utahn at one point or another either mated together or running mixed (normally with two or four A/B units). If these were not on the head-end then up to four uncommon F3s equipped for passenger service were assigned to the train. 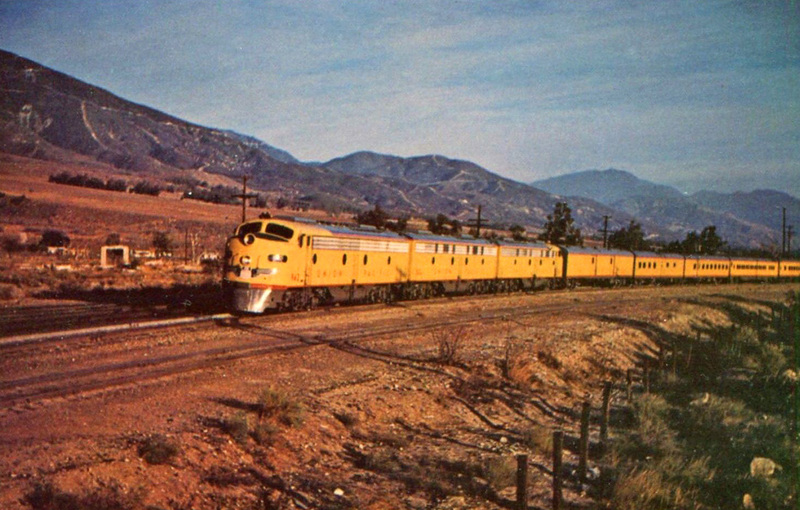 The Utahn was never a part of the railroad's celebrated streamliner fleet although like with the sleeper mentioned above did occasionally run with Armour Yellow and grey lightweight cars. 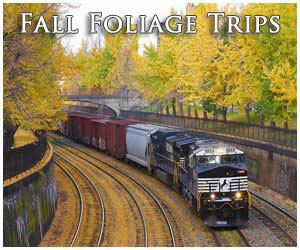 As Union Pacific continued shaking up its passenger fleet the train became a victim of these changes. Its final run occurred on April 29, 1951 when the City of St. Louis took over its route and began running all of the way to Los Angeles as a single train that gained status as a streamliner. 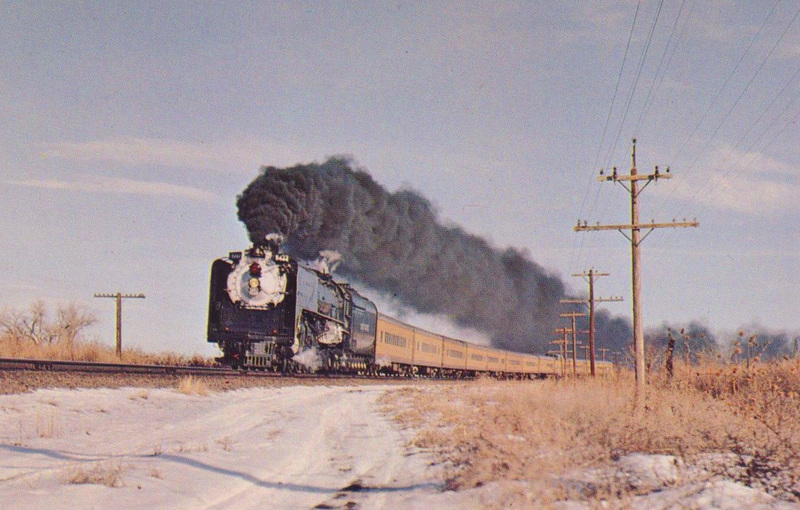 Interestingly, at that time UP was still experiencing strong ridership, so much so that it placed orders for more new equipment in the mid-1950s when the fabled Domeliners began appearing on its top trains. 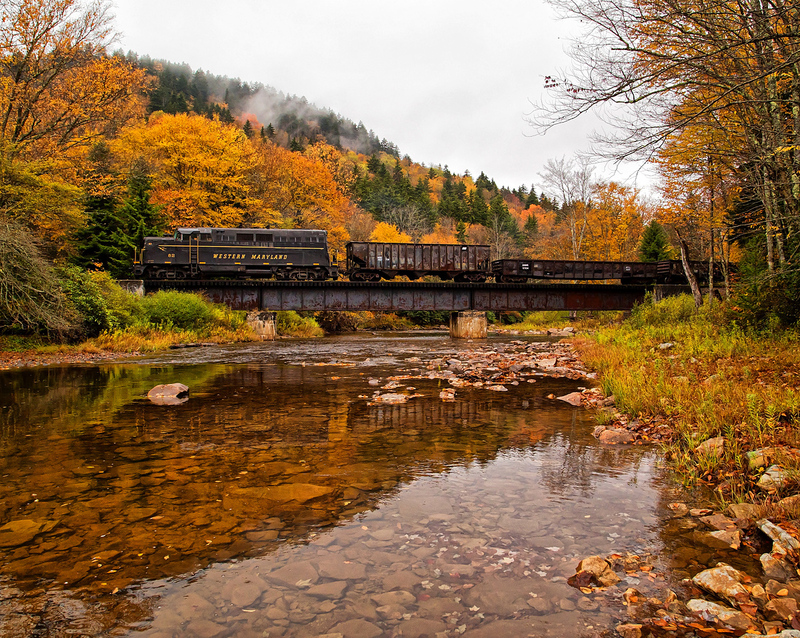 These cars are often regarded as the most memorable ever used on the railroad, especially the diners which allowed passengers the unique and unparalleled experience of enjoying their meal perched high above the passing western landscape. Some of these domes were equipped on the St. Louis and it continued receiving more through 1958. Unfortunately, just like the rest of the industry Union Pacific experienced declining ridership from the late 1950s forward, a trend which would never reverse itself. In 1964 the St. Louis began running combined with the City of Los Angeles west of Ogden, one of many similar moves UP made in an effort to reduce growing red ink. 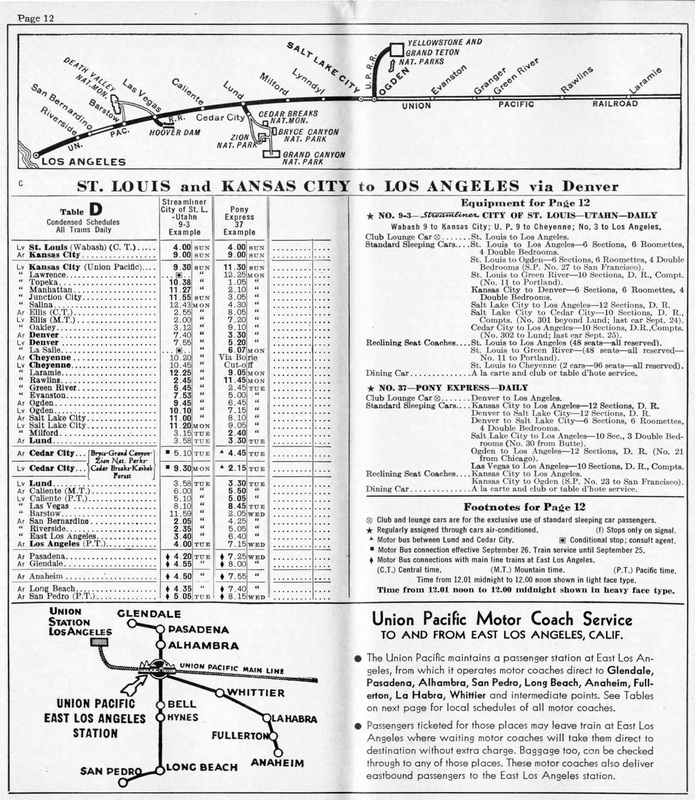 A few years later it was combined entirely with the City of San Francisco east of Ogden, effectively ending the St. Louis as a separate train. Until the start of Amtrak in 1971 Union Pacific continued combining trains but always maintained a high and impressive level of service, on par with the Santa Fe right until the very end.